United Nations Secretary-General Ban Ki-moon received an honorary doctor of humane letters degree and delivered the keynote address during Fairleigh Dickinson’s annual Academic Convocation on September 10, 2008. This marked the second time in FDU’s history and the first time in 55 years that the University conferred an honorary degree upon a U.N. secretary-general. 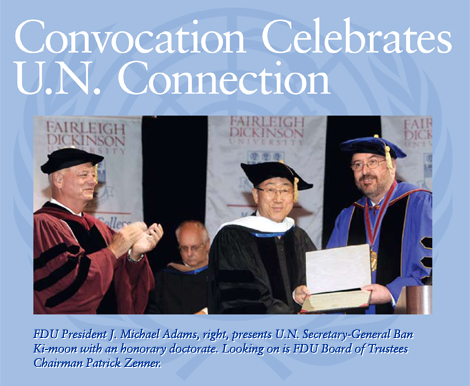 FDU President J. Michael Adams presented the degree to Ban Ki-moon “in honor of his extraordinary accomplishments” and “in admiration of his determination to build a stronger United Nations … and a United Nations responsive to a complex and interdependent world.” Ban Ki-Moon’s historic address can be viewed online at www.gig.org. The convocation also featured the presentation of faculty and staff awards, as well as the conferring of a new endowed chair in honor of trustee and alumnus Gregory Olsen, BS’66, BS’68, MS’68 (T). The following are excerpts from Ban Ki-moon’s keynote address, “Thinking Globally in a Global Age.” A transcript of the full address is available at www.un.org.